Ductile Iron (also known as Spheroidal graphite iron or Nodular Cast Iron) was invented in 1949. Ductile Iron retains the corrosion resistance of cast iron but has more than double the tensile strength [Cast Iron- 180 MPa (min), Ductile Iron – 420 MPa (min)]. The essential differences between Ductile and Cast Iron lies in the shape of the graphite in the microstructure of the metal. In Cast Iron, the graphite is present in plate-like flakes, which makes Cast Iron brittle. But in Ductile iron, the shape of the graphite becomes a spheroidal nodule, which offers better mechanical properties and makes Ductile Iron sturdy, Structurally stronger and shock-proof. Pressure Class – C20, C25, C30, C40, C50, C64, C100. Intrinsic corrosion resistance of Ductile Iron in various corrosive soils is as least as good as and even somewhat better than that of Cast Iron, as there is not much variation chemically between the two materials. When subjected to corrosion, the nodular graphite of ductile iron pipes forms corrosion by products that adhere firmly to the unattached metal, which provides a barrier against further corrosion. In addition, uniform spreading of spheroidal graphite of ductile iron results in less susceptible to deep localized pitting than that of grey iron pipe, which is important in evaluating its relative resistance to failure by perforation. Due to rubber gasket jointing, ductile pipes are electrically discontinuous. As a result, long line corrosion current, which is dependent on exposure of a single electrical unit to varying soil conditions, cannot develop. Additionally, any accumulation of stray current is limited to short electrical units and usually is of little significance in developing corrosion. Flanges are flat rings around the end of pipes which mate with an equivalent flange from another pipe, the two being held together by bolts usually passed through holes drilled through the flanges. A deformable gasket, usually elastomeric, placed between raised faces on the mating flanges provides the seal. 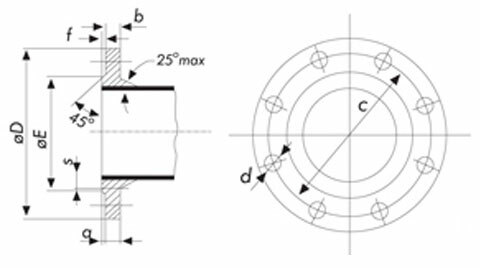 Flanges are designed to a large number of specifications that differ because of dimensional variations in pipes sizes and pressure requirements, and because of independent standards development. In the U.S. flanges are either threaded or welded onto the pipe. In the European market flanges are usually welded on to the pipe. In the U.S. flanges are available in a standard 125lb. bolt pattern as well as a 250 lb (and heavier) bolt pattern (steel bolt pattern). Both are usually rated at 250(1,700kPa). A flanged joint is rigid and can bear bothtensionandcompressionas well as a limited degree ofshearandbending. It also can be dismantled after assembly. Due to the rigid nature of the joint and the risk of excessive bending moment being imposed, it is advised that flanged pipework is not buried. Spigot and sockets involve a normal pipe end, the spigot, being inserted into the socket or bell of another pipe or fitting with a seal being made between the two within the socket. Normal spigot and socket joints do not allow direct metal to metal contact with all forces being transmitted through the elastomeric seal. They can consequently flex and allow some degree of rotation, allowing pipes to shift and relieve stresses imposed by soil movement. The corollary is that unrestrained spigot and socket joints transmit essentially no compression or tension along the axis of the pipe and little shear. Any bends, tees or valves therefore require either a restrained joint or, more commonly, thrust blocks, which transmit the forces as compression into the surrounding soil.A large number of different socket and seals exist. The most modern is the ‘push-joint’ or ‘slip-joint’, whereby the socket and rubber seal is designed to allow the pipe spigot to be, after lubrication, simply pushed into the socket. Push joints remain proprietary designs. Also available are locking gasket systems. These locking gasket systems allow the pipe to be pushed together but do not allow the joint to come apart without using a special tool or torch on the gasket.The earliest spigot and socket cast iron pipes were joined by filling the socket with a mixture of water, sand, iron filings and sal-ammoniac (ammonium chloride. )Agaskinring was pushed into the socket round the spigot to contain the mixture which was pounded into the socket with a caulking tool and then pointed off. This took several weeks to set and produced a completely rigid joint. Such pipe systems are often to be seen in nineteenth century churches in the heating system.